In the Month of April 2014 one after the another Mangal Utsav, Morning Prayers & Meditation , Yoga Camp, Spiritual Retreat, Satsang with Mahatmas continued here at Sivananda Ashram, as if Utsav Ganga flowed in a true sense. Sri Ramnavmi Utsav (April 8, 2014) From March 31th to April 7th , large numbers of devotees joined in daily Navahan Parayan of holy Sri Tulsi Ramayan at Sri Ashtalakshmi Bhavan. It concluded on Sri Ramnavmi day with grand worship of Lord Sri Rama at Sri Rama temple of the Ashram. Sri Hanuman Jayanti (April 15, 2014) At the Ashram, Holy Sri Hanuman Jayanti was celebrated and Maruti Yajna was performed by devotees at Sri Dukhbhanjan Hanuman Temple of the Ashram. Thirteen days long annual function of Sivananda Ashram was formally inaugurated with blessings and lighting the lamp by Acharya Mandaleshwar Raj Guru 1008 Sri Swami Vishokanandaji Maharaj of Sri Panchayati Nirvana Akhada of Traditional Monastic order of Ancient India. Swami Sri Vishokanandaji Maharaj cherished sweet memories of darshan of Gurudev Sri Swami Sivanandaji Maharaj in his pre-monastic life and said that He was fortunate to receive love and grace of Revered Sri Swami Chidanandaji Maharaj also. "You all are blessed indeed to have Swami Adhyatmanandaji Maharaj as your Acharya. I see in Him a zeal of Swami Sivanandaji Maharaj as well as kindness of Sri Swami Chidanandaji Maharaj, follow his guidance and reap the harvest of blessedness", He added. Jnana Yajana (April 21, 2014 -May 2, 2014) Acharya Sri Swami Umeshwardevji Maharaj of Sri Brahma Vidyapeeth , Kailash Ashram of Rishikesh gave discourses on Kenoupnishad every morning from 7.00am -8.00am and in the evenings from April 21 to April 26. Pujya Sri Swami Adhyatmanandaji gave Discourses on Chapter 6th of Bhagawad Gita. 768th Yoga, Meditation & Pranayam ( April 21, 2014 -April 30, 2014) Ten days Yoga camp was conducted by Pujya Swami Adhyatmanandaji. About five hundred people attended the camp. On April 27, 2014 morning voluntary Blood Donation drive was organized at Ashram. About seventy two donors donated blood. Gujarat Divya Jivan Sangh (April 27, 2014) Annual meeting: It started with prayers & Guru Vandana and Pujya Swami Adhyatmanandaji welcoming them all. About three hundred members attended the meeting held by Gujarat Divya Jivan Sangh here at Sivananda ashram, Ahmedabad. Key members of the most of the centers of Gujarat Divya Jivan Sangh were present. It was a nice exchanged of thoughts in Sivanadic spirit amongst them. Sri Arunbhai Oza briefed the members to the Karma Yoga activities, seva projects, Note Book distribution project to underprivileged children, Divya Jivan Monthly Journal membership and requested their continued supports. H. H. Sri Swami Umeshwardevji Maharaj (Rishikesh), Sri Swami Anantananda Tirth (Vehlal), Sri Dev Prasad Bapu (Jamnagar) and Sri Swami Asanganandaji (Heranj) graced the occasion. In the evening Smt. Manishaben and Sri Deveshbhai Dave 's sangeet enchanted all. On the auspicious occasion of 14th Patotsav of Sri Ashtalaxmi intense spiritual activities were organized at the Ashram. It commenced on April 28th and concluded on May 3rd Devotees were fortunate to get darshan and satsang of Mahatmas. Number of Saints, Sages and Spiritual leaders of number of spiritual and religious organizations graced the occasion. And also thousands of devotees were served Bhojan( Prasad) during these festivities. 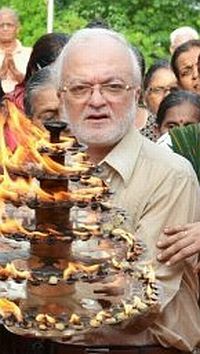 From April 28, 2014 to May 1, 2014 Sri Sunderkand Parayan by well-known Ramayani Sri Ajay Yagnikji of Delhi was organized for four days in Ashram’s lawns, which was attended by large number of devotees. 14th Patotsav of Sri Maa Ashtalaxmi Adishakti Peeth Utsav(April 29, 2014) The day began with early morning Sri Yantra Puja by devotees together with Revered Swami Adhyatmanandaji Maharaj, followed by Holy Navachandi Yajna, Maha Aarti, "Sadhu Bhojan" and MahaPrasad served to all. Number of Saints, Sages and Spiritual Leaders of number of spiritual and religious organizations graced the occasion. A festive & jubilant mood turned into a sorrowful mood with sudden loss of a dear member of Sivananda family. Sri Rajivbhai, a trustee and an honorary secretary of Sri Divya Jivan Sanskrutik sangh, He suffered a massive heart attack and passed away on April 29th midnight. On May 2nd night Prayer meeting was held to pay homage to Sri Rajivbhai. The rest of the days activities were rather quite at the ashram. On May 3, 2014 Pujya Sri Swami Adhyatmanandaji 70th birthday serving poor on a large scale with big meal has been planned and in the evening soothing devotional music by Pandit Sri Niraj Parikh. Malsar April 1, 2014): Maha Mandaleshwar Sri Vishwambhar Bharatiji Maharaj’s 85th Happy Birthday was celebrated at Sri Yogeshwar Dham, Sri Satyanarayan Temple at Malsar on the holy banks of River Narmada. Sri Swami Adhyatmanandaji attended this holy occasion with hundreds of monks and a large crowd of devotees. Swamiji composed a poem in praise of birthday celebrity. Hundreds of monks and thousands of devotees cherished this blessed event. Ahmedabad (April 5, 2014): A book by Revered Father Ishananda Vempeny ‘Corruption A National Cancer’ was released by Sri Swami Adhyatmanandaji at prestigious auditorium of famous Loyola College at Ahmedabad. Sri Swami Adhyatmanandaji gave a forward and highlighted the essence that Love for our country, the Spirit of patriotism and service to our country as well for the fellow citizens, only we can stop corruption at individual, social and national levels. This book is a publication of Indian Social Institute, New Delhi. On April 10, 2014 National TV Channel who mainly telecast Gujarati religious program invited Sri Swami Adhyatmanandaji and recorded a talk on the subject of physical and psychic health, supported by Dr. Mayur Patel (Diabetologist) and Vaid Bhavdeep Ganatra (An Ayurveda expert) for the discussion. Vadodara( April 12, 2014) Maharaja Sayajirao University, Vadodara’s faculty of Management organized a discourse by Sri Swami Adhyatmanandaji, in memory of Sri Suren Chokshi. It was attended by elite group. Sri Swamiji shared much elaborated thoughts on the subject of “Paths to Meditation”. This was followed by practical instructions on Meditation. April 13, 2014 (Ahmedanad) ‘Seva Ratan" award was awarded to Mr. Ghelubhai Naik of Dang Forest of South Gujarat by Sri Sadvichar Parivar of Ahmedabad. Rev. Sri Swami Adhyatmanandaji presided over the function. Sri Swamiji said, “Sri Ghelubhai is known to me since last three decades. I know him as a Lion of Dang Forest. His friends are tiger, bear and such animals. He is expert in catching snakes. He will catch live cobras. At age 94 he has a zeal of youth, He is a man with full of energy, enthusiasm, vibrant attitudes. Sri Ghelubhai is a very special person with God given talents. Rupees one lakh twenty five thousand was awarded to him for his wonderful services to tribal people of Dang and Citation was presented in Silver Casket. On April 15, 2014 Sri Hanuman Temple of 11 Divison Army Regiment has concluded 350 years of its establishment. Rev. Sri Swamiji Adhyatmanandaji had an honour of cutting 350 kg cake for Lord Hanuman. It was estimated that about six lakhs devotees visited throughout the day for the darshan of Lord Hanuman. April 18, 2014 (Khanderapura) A village people Khanderapura, are planning to build Sri Ram temple at their village and two Crore Rupees is estimated expense. They organized a fund raising program. Pujya Swmiji was invited for this function. He inspired people to write two Carore likhit japa of Sri Ram Mantra. He said money will pour with the grace of the Lord. They said that about one Carore got donated by people on that occasion, a grace of the Lord Rama. On April 19, 2014 the Brahmotsava of Sri Sri Sri Tirupati Tirumala Balaji of Ahmedabad was celebrated by flag hoisting by Sri Swami Adhyatmanandaji Maharaj at the start of the three days long festival. April 20, 2014 Gandhinagar A four hours of television recording was recorded by Sri Swami Adhyatmanandaji upon the sincere request of the Vice Chancellor of Dr. Ambedakar University for on line teachings of Yoga Certificate course. Sri Swamiji covered in short, basic of Yoga learning, its purpose its benefits, what is Yoga? Yoga for whom? why Yoga ? Practical lessons in Yoga, Patanjali Yoga Sutras and Astanga Yoga. With great pain and sad feelings Sivananda Ashram is announcing the sudden and shocking death of Sri Rajivbhai Shah, a trustee and secretary of Sri Divyajivan Sanskrutik Sangh and trustee of Gujarat Divya Jivan Sangh. He suffered a massive heart attack on April 29th at midnight. He was 59 year old. He has earned love and respect of all with his gentle, polite and kind nature. He was ever soft spoken, generous and God fearing. He was a man of purity, character and dedication. He was an asset to Ashram. His loss has created a vacuum in the ashram. He was heart and breath of all the activities of the Ashram. His is an irreparable loss to the ashram. People will be cherishing his loving & selfless personality for long time. He has left behind him, mother Ushaben, wife Smt. Shilpaben, two sons named Kandarp & Kathan and his three favorite pets Snoopy, Oscar & Rasky. President, Trustees and members of Sri Divya Jivan Sanskrutik Sangh and Sri Gujarat Divya Jivan Sangh join together in prayers for peace & freedom of departed soul of Sri Rajivbhai and they extend their heartfelt condolence to all the members of his divine family! May his departed soul rest in everlasting peace and bliss absolute! May God give strength to his divine family to withstand his physical loss!